Last week, we introduced you to our newest product, Genmou yarns and patterns, which were a collaboration between Daruma spinners and Amirisu. 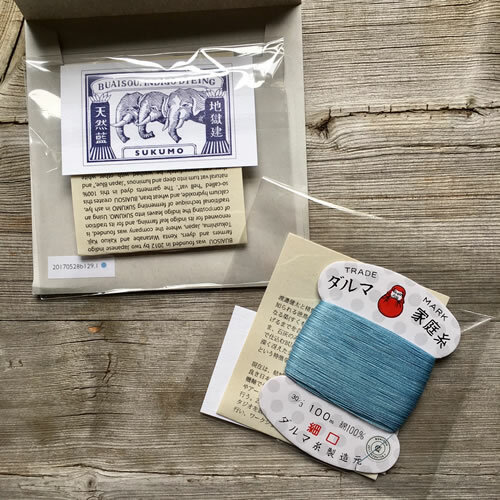 We have also shown the beautiful Buaisou Indigo threads that we carry, which are spun by Daruma as well. We thought you might like to see some behind the scenes shots of this interesting, old, Japanese company. Archive packaging of Daruma products. Pictures courtesy of Daruma. 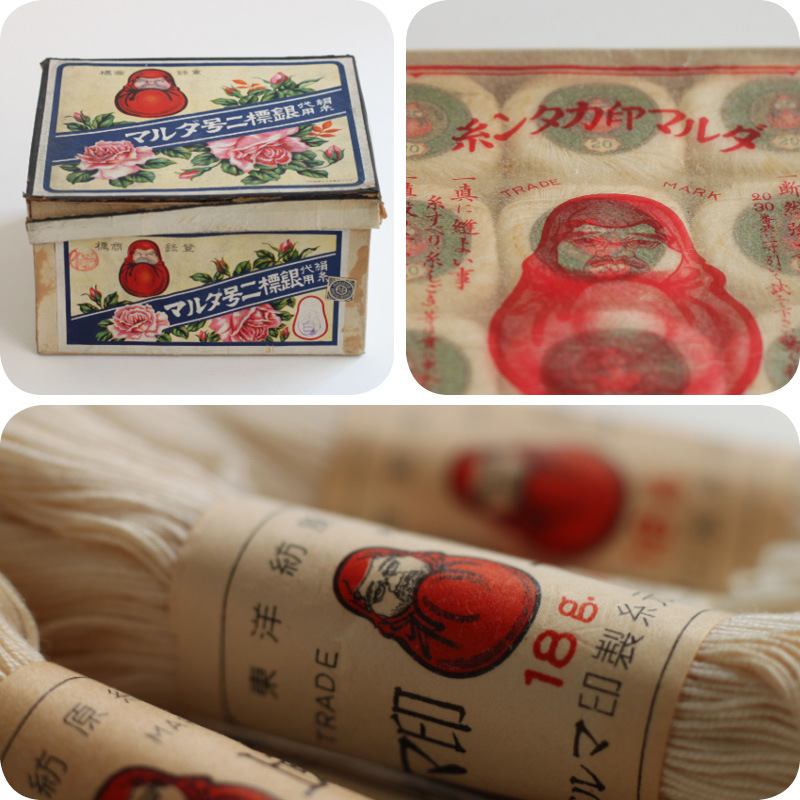 Daruma threads have been manufactured since 1901. The company matured, after World War II, when crochet became popular in Japan. They provided much of the crochet cotton for the market. Historical Daruma packaging and processing inside the Daruma factory. Pictures courtesy of Daruma. They expanded to include sewing kits and supplies and now spin wool yarns as well, such as Genmou. Daruma yarns and threads are made in ‘Bishu’, the main area in Japan for woolen fabric. Bishu is on the Noubi Plain, the source of the river Kiso, an easy place to grow mulberry and cotton and the soft water is suitable for the dyeing process. Tsukushi cardigan designed by Veera Välimäki for Genmou. All the photos for this collection of designs were photographed inside the Daruma factories. They launched their Genmou wool yarn internationally last week and brought out a beautiful range of patterns in collaboration with Amirisu. We showed you some of the patterns available last week but have a look at the whole range. Buaisou Indigo dyeing, photos courtesy of Buaisou. 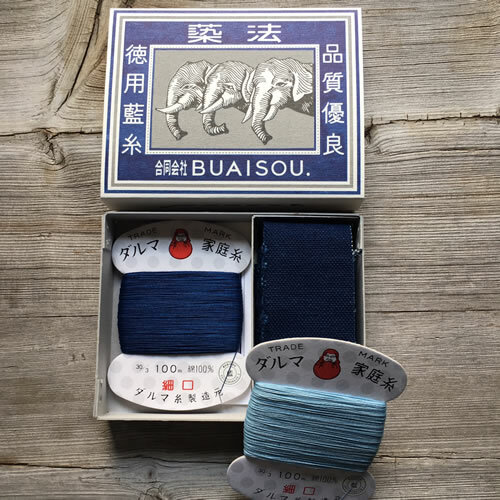 The Buaisou company was founded by two Japanese indigo farmers and dyers in Tokushima, a prefecture in Japan renowned for its tradition of indigo leaf farming and composting indigo leaves into Sukumo. 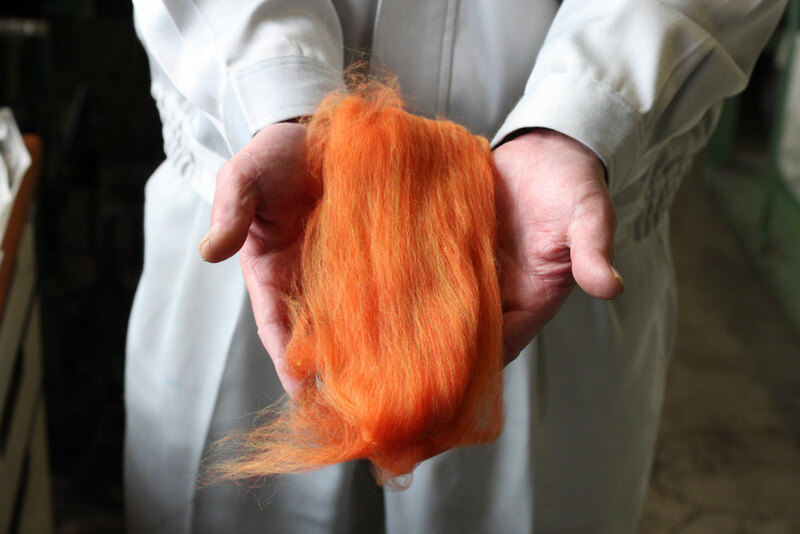 Using a unique and traditional technique of fermenting Sukumo with other natural, organic elements, this is developed into a natural dye used to create a beautiful, deep and luminous colour known as “Japan blue”. The artisan team of dyers at Buaisou have worked at preserving this tradition of dyeing with this distinctive and striking blue. 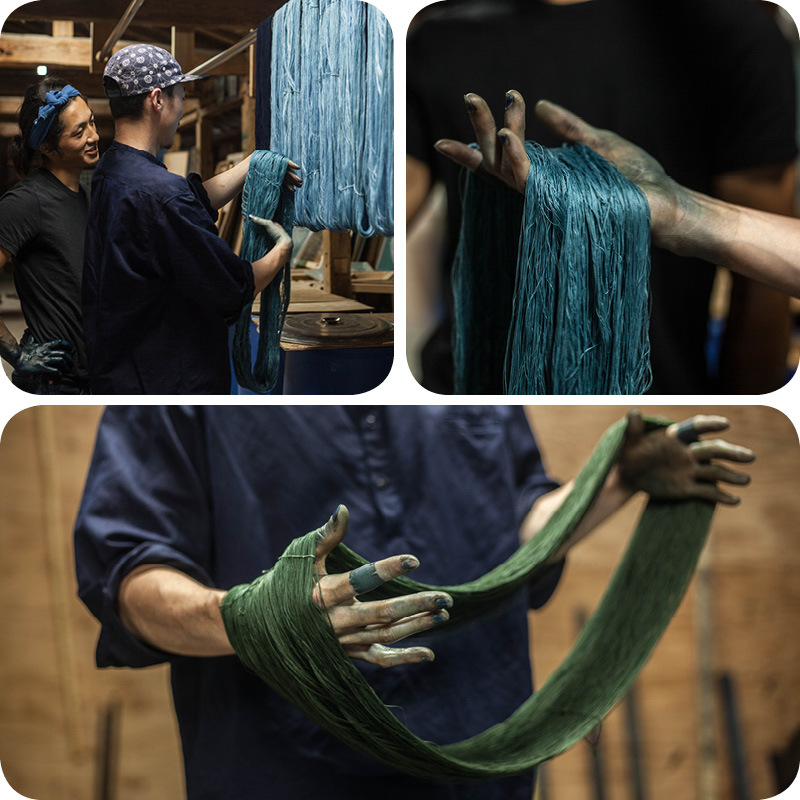 Buaisou indigo dyers also collaborate with Daruma. 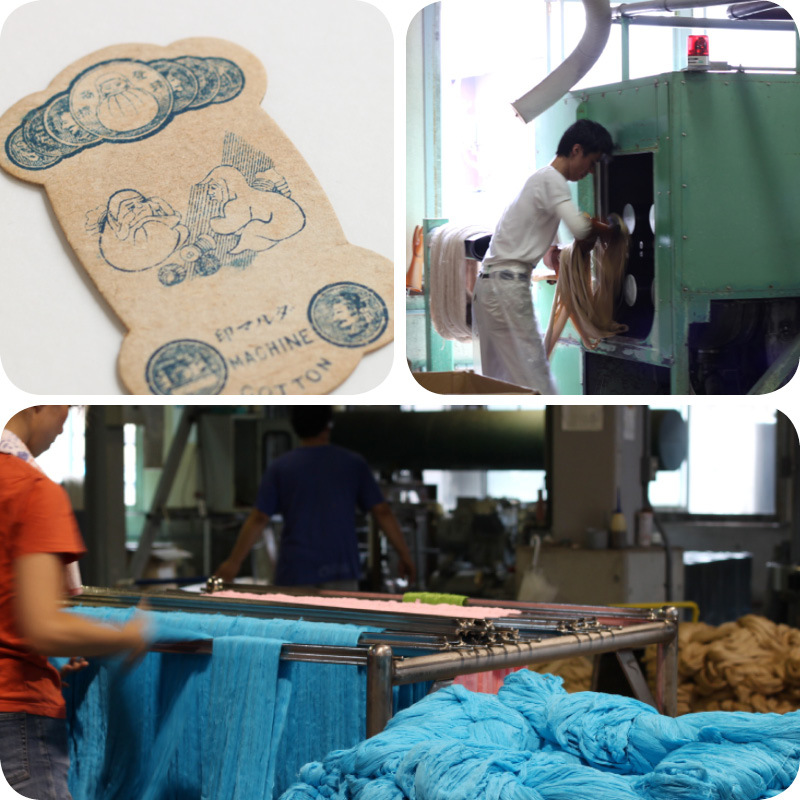 They use the smooth cotton embroidery threads that Daruma produce, as the base for their natural indigo dyed cotton. We carry four shades of their beautiful Indigo threads. We love to find unique, high quality products made by craftspeople. We hope you enjoy seeing them as much as we do.